RETURN TO THE HYPERWAR HOME PAGE. RETURN TO THE HYPERWAR WHAT'S NEW PAGE. U. S. S. BOISE (CL47) DANFS HISTORY at the Naval History and Heritage Command website. (a) C.O. USS BOISE conf. ltr. CL47/A16-3 undated, (forwarded by CincPac, Pac-90-1h, A16-3/S0L, 03151 of Oct. 30, 1942). (b) Comdt. N.Yd. Philadelphia, L11(conf) CL47/41-1(E3-4) of Dec. 17, 1942. (c) Inspection of ship by BuShips representatives, 20 Nov. 1942. (d) C.O. USS NAVAJO conf. ltr. AT64/S94 of Nov. 5, 1942. Showing dent in armor and patch over hole in shell. 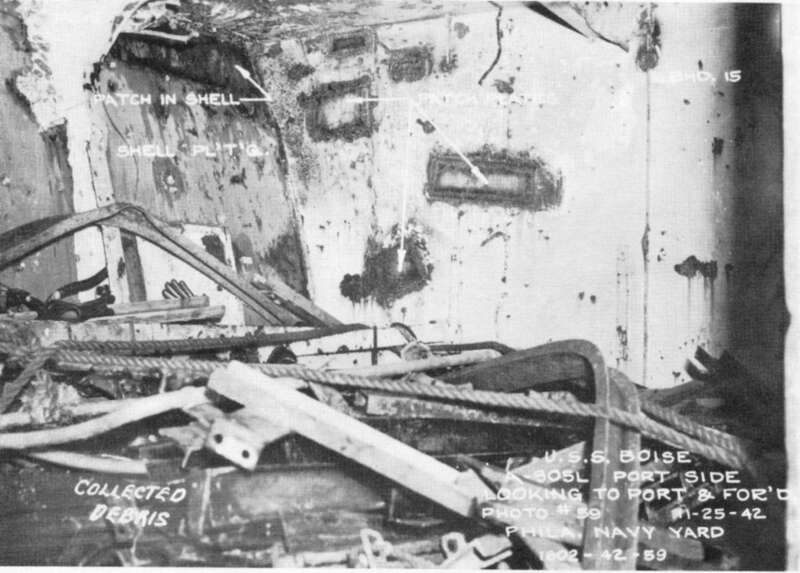 View inside showing location of degaussing cables cut by fragments. Looking outboard in Captain's cabin. Centerline bulkhead showing fragment damage in forward part. 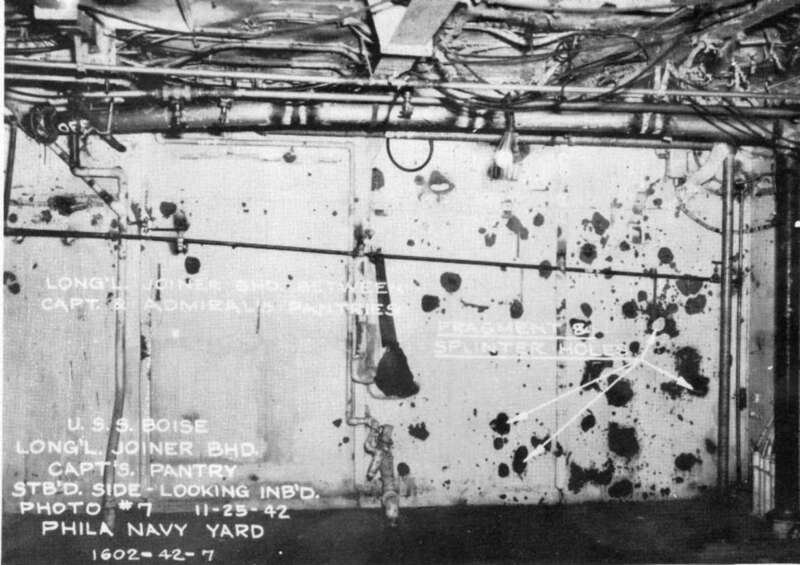 Viewed from starboard side in Navigator's office and showing approximate paths of projectiles. 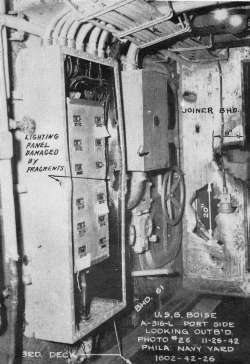 Lighting panel damaged by splinters, and holes in bulkhead of overcoat locker. 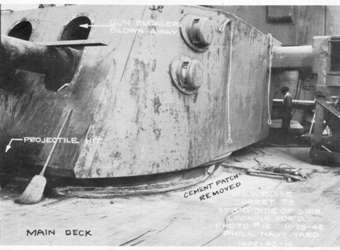 Showing hit on face plate of turret III and damage done to main deck. 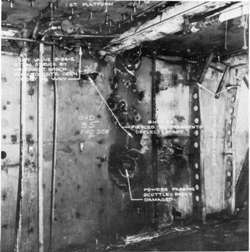 Fragment damage to vent trunk on superstructure at frame 54. Fragment damage to second deck below hit. 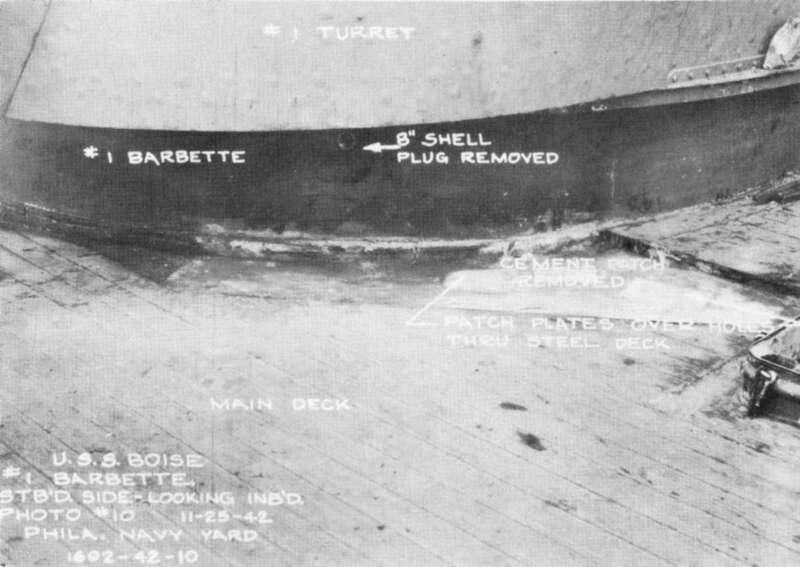 Location and damage to main deck. Closeup showing performance of armor. 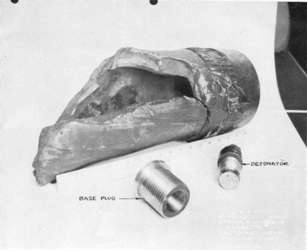 Projectile as recovered from the barbette. 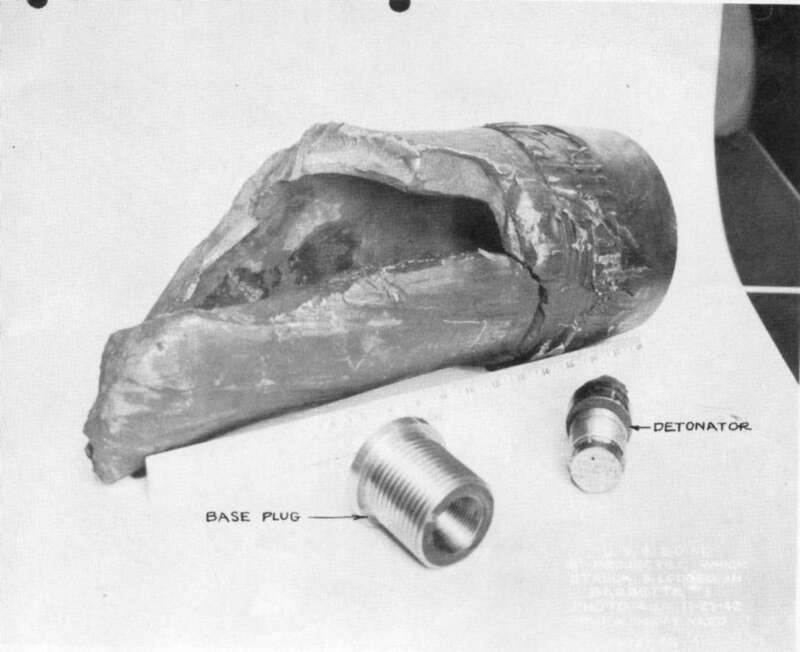 Portions of base of projectile. Markings and design >features indicate English manufacture. 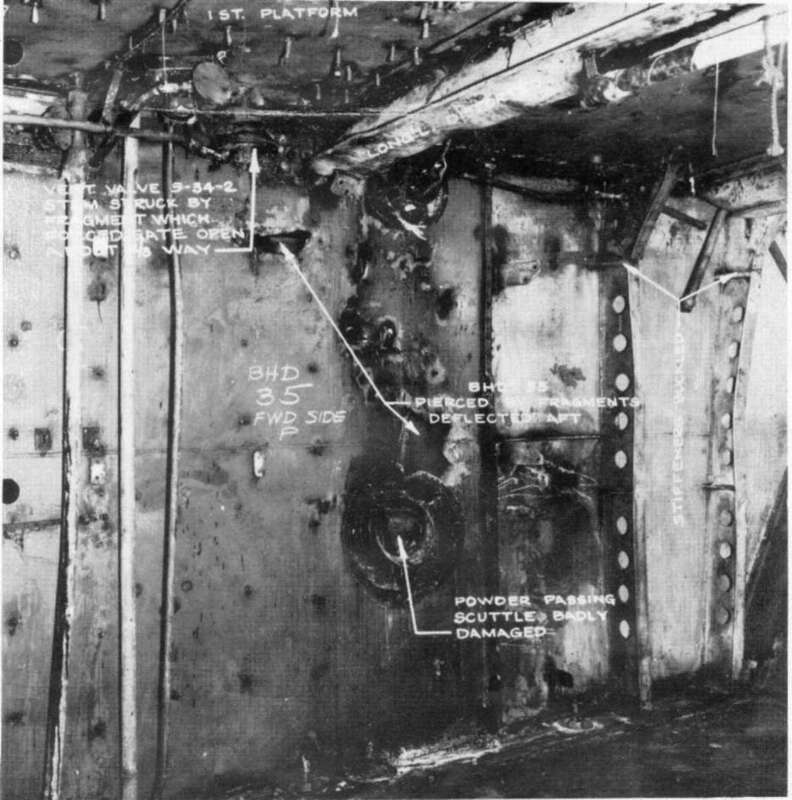 Fragment damage to bulkhead 35 viewed from magazine A-507-M.
Fragment damage which opened closure to supply ventilation system and conducted flames to second deck. 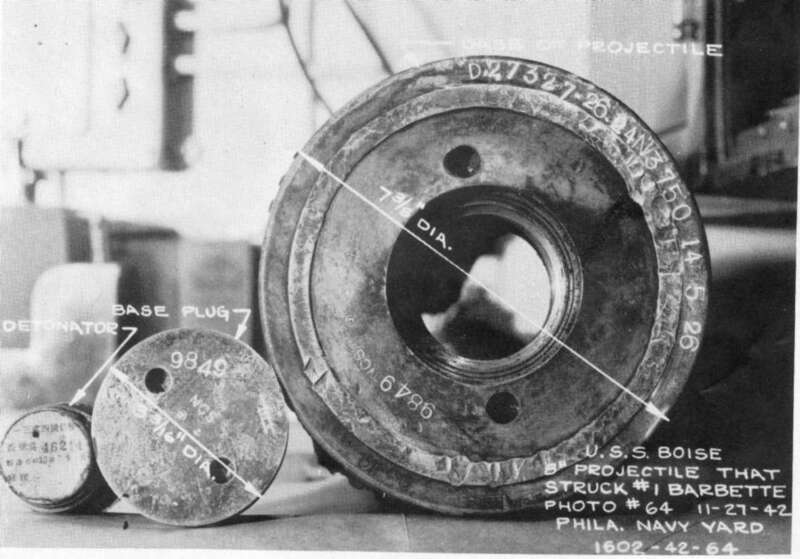 Fragments of projectile which exploded in A-507-M.
Shows powder hoist burst open on shell handling level in turret I. Lower handling room of turret I showing open ends of powder hoists with powder cartridges still in hoists. Note that powder burned out of No. 1 and No. 2 cartridges but not No. 3. No. 2 cartridge was apparently forced down over No. 3 by pressure from powder burning above it in the hoist. Typical damage to magazine doors in handling room No. II. except what came in through the distorted door - see photo 19. Fragment damage on port side of third deck - opposite hit. The debris in the foreground was collected and stored here as scrap. Door to Magazine A-608-M - the scene of a separate explosion as described in paragraph 20. 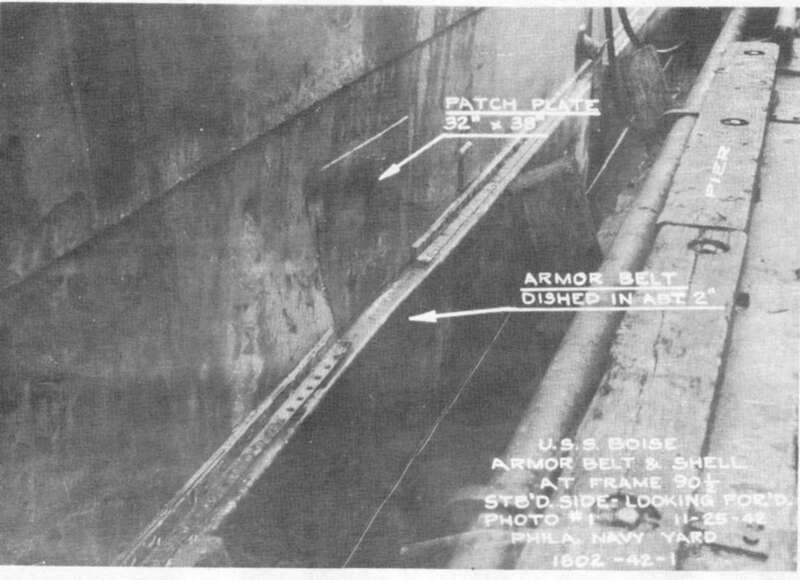 This is the first case of gunfire damage to a United States ship which the Bureau has been able to analyze. Because of its unusual interest, this report was prepared as soon as a reasonable amount of information became available. If further information of interest becomes available a further report will be made. 2. BOISE proceeded to Espiritu Santo, arriving there about 1600 October 13 and leaving about 1700 October 15. This was only long enough for NAVAJO to put a soft patch over the hole at frame 17 and to clean up the ship. She then proceeded to Noumea where ARGONNE made temporary repairs. Openings in the hull were closed and interior watertight integrity restored. BOISE departed Noumea on October 24 and arrived at the Navy Yard, Philadelphia, on November 19. 3. A projectile from about 090° relative struck the 5 inch class "A" side armor about one foot below the top at frame 90-1/2 and exploded on impact. This hit made a dent in the armor about 2 inches deep at the point of impact and the explosion made a hole about 23" x 26" in the 25 lb. STS plating above the armor belt. The plating was also buckled for about 5 ft. aft of the hole. From the extent and type of. damage done it is estimated that this was an 8 inch common projectile. 4. The only important damage done by this hit was the cutting of all degaussing cables on the starboard side of the third deck by fragments. The hammock stowage, steam tables, expanded metal bulkhead, and ventilation systems overhead in C-301-L were all damaged by fragments. The 10 lb. STS plate under 20 mm mounts 7 and 9 was struck by fragments but was not penetrated. This platform is about 19 ft. above the point of impact and overhangs the gunwale about 2-1/2 ft. There were no fires or flooding from this hit. 5. One or more projectiles struck the outboard bulkhead of the Captain's cabin at frame 6l-l/2 starboard, about 2-1/2 ft above the main deck. This hit (or hits) apparently came from about 100° relative. One shell apparently exploded on impact as it blew a 4 ft. by 5 ft. hole in the 12 lb. outboard bulkhead. 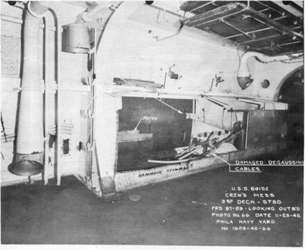 The passageway and the interior of the cabin were sprayed with fragments and the longitudinal bulkhead between the cabin and the pantry about 15 ft. inboard was demolished. 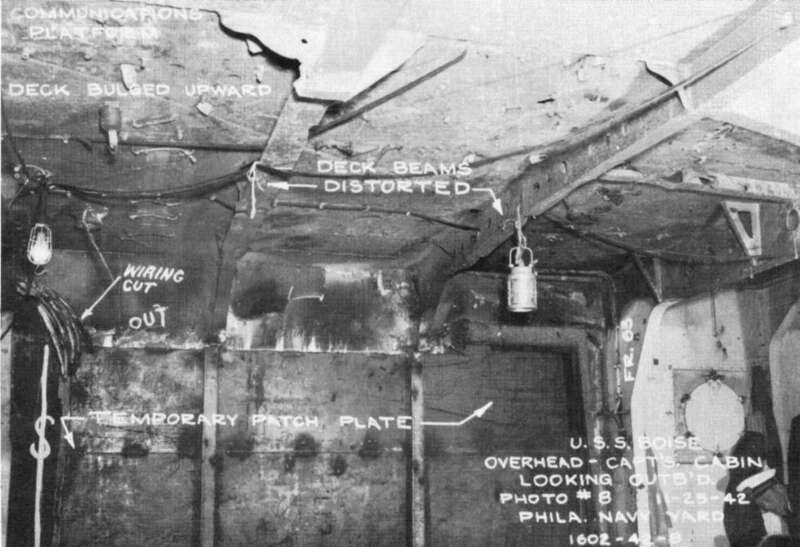 Other bulkheads and doors in the vicinity were damaged as shown on plate I Two fairly deep grooves were made in the deck, one probably by a nose fragment, the other by a second projectile which exploded inside the cabin. 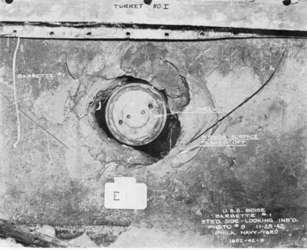 The centerline bulkhead was riddled with fragments in the forward corner, the largest hole being about 10" by 18". All furniture in the cabin and pantry was destroyed and the sheathing was riddled. Some fragments passed through the Admiral's cabin and out the bulkhead on the port side. around the gun. The 30 lb. STS deck under the communication station rejected all the fragments which hit it. 7. The explosion started a fire in the Captain's cabin. It was not serious and was completely put out by the damage control party and members of adjacent gun crews in about 12 minutes. 8. Two projectiles hit at frame 58-1/4 on the starboard side, three feet above the third deck, and passed through the ship without exploding. They apparently came from about 080° relative and were probably 5" in diameter. Both shells pierced a stanchion in the Navigator's Office. One then bounced off the 80 lb. STS deck, leaving a groove about 4 inches deep and 3 ft. long, glanced off the hatch coaming at frame 61 and passed through bulkhead 61 in the overcoat locker and out the port side as shown on the sketch (plate I). The other passed through the coaming around the armored hatch, glanced off the rifle rack and joiner bulkhead of the overcoat locker, and went out the port side about 16 inches aft of frame 59, 20 inches above the deck. One man was injured, apparently by linoleum fragments gouged up off the deck. Some electrical systems in the vicinity were damaged as described in paragraph 32. 9. A small fire was reported to have started but it was quickly put out. The holes in the side were above the waterline, but slight flooding occurred as described in paragraph 28. They were plugged with mattresses and shored. Steam from a ruptured heating line caused some difficulty for those working in the compartment. 10. A projectile of unknown size struck just under the left gun of turret III while the turret was trained out to starboard. It exploded on impact with the 6-1/2" class "A" face plate, loosening the joints of the plate and making several very small surface cracks in the armor. The turret was trained 105° at the time and the projectile apparently came from about 095° relative giving an obliquity of about 10° for this impact. In view of the very small amount of damage to the armor it is assumed that this was not an A.P. projectile. frame 55 (about 30 ft. from the explosion) was riddled (photo No. 8) but the 30 lb. STS around the coding room was not penetrated although it was marked up considerably. All three guns of the turret had fragment gouges in the slides; these guns continued in operation, however, and fired several salvos -gun captains noticing a shortened recoil. 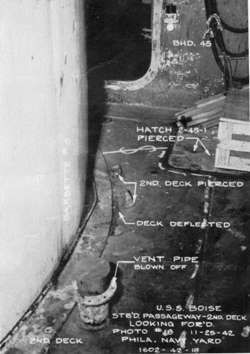 The fragments which passed downward through the main deck pierced all vent pipes in A-211-L, (photo No. 9). They also pierced W.T. door 2-49-1, the W.T. hatch in the starboard passageway on the second deck, and made several holes in the second deck. 12. No fire resulted from this hit as most of the flash and flame was in the open above the main deck. 13. An 8 inch A.P. projectile struck the 6 inch class "A" armor of barbette No. I about 55° to starboard of the centerline and about 15 inches above the main deck. The projectile was defeated by being broken open and stopped with its base just inside the outer surface of the armor as shown in photos No. 10 and 11. The nose was stuck in the circular bulkhead around the gun pan just under the shelf plate and the turret jammed in train at 106° relative. The hardened face of the armor separated in large flakes and the tough back flowed with the projectile as would be expected (photo No. 11). Apparently the projectile was cracked open by the impact with the hard face of the armor as there was no explosion, only a fizzing or burning action which was heard for several seconds and filled the turret with smoke. The lower side of the projectile was blown out into fragments, the largest of which was about 2 inches by 4 inches. Aside from the hole the nose made in the circular bulkhead and a crushed vertical web outboard of the gun girder there was no damage inside the barbette. Outside, the deck was splintered, probably by fragments from the barbette, and the main deck was penetrated in three places. The turret officer reported that the turret had been hit and was being abandoned. Eleven men, most of them from the left gun crew, succeeded in getting out before the powder fire burned the turret out from below. They reported that when they got out on deck, turret II was on fire. This fire was started by Hit No. 6 which was apparently in the same salvo as No. 5.
first platform deck (just below the 80 lb. STS side armor). It passed through the wiring passage A-509-T, struck the deck of magazine A-507-M and bounced upward and aft probably exploding about 3 or 4 ft. off the deck just to port of the centerline at about frame 34. Fragments made a great many holes in bulkhead 35 between the magazine and the lower handling room of turret II, and in overhead beams. 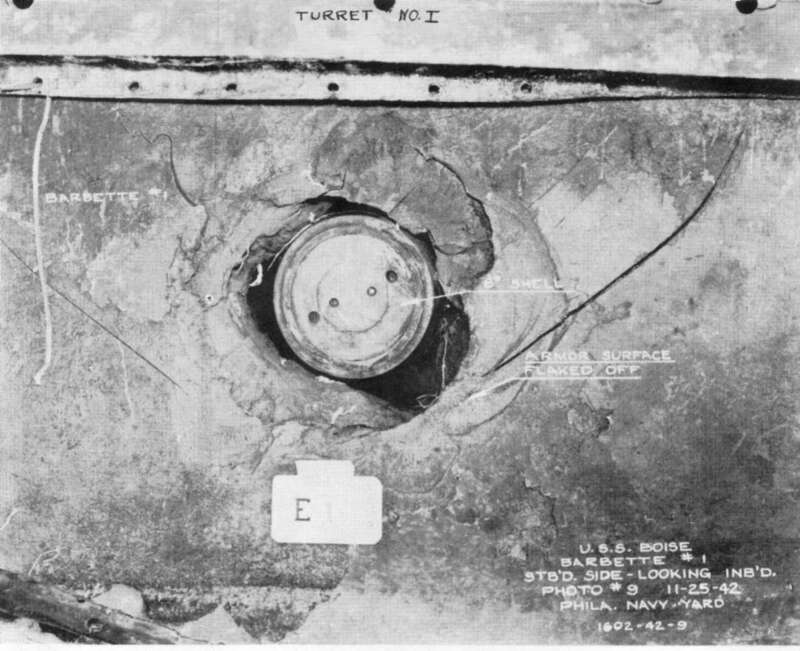 Several fragments pierced bulkhead 39 and the door in this bulkhead, and one traveled aft through A-515-M to pierce the door to No. 3 lower handling room. One fragment pierced a small hole in the second deck over fuel oil tank A-610-F. One large fragment struck a gate valve on the supply ventilation system to A-507-M and caused it to open by shearing off the valve bonnet and pulling the gate about half way off its seat (photo No. 15). The exhaust duct also had its closure destroyed by fragment damage. 15. The explosion of the shell in A-507-M ignited all cartridge cases out of tanks in the magazine, and two cartridges in tanks were pierced by shell fragments, ignited, and burst open. The majority of unopened tanks in A-507-M were badly crushed by the blast, but the powder in them was not ignited. The flame from this fire quickly passed into the lower handling room of turret II through the holes in bulkhead 35, ignited the powder in the hoists and burned up through the entire turret, bursting the powder hoists open along the seam on the various levels within the turret. This was the fire observed by the men abandoning turret I. The fire in No. 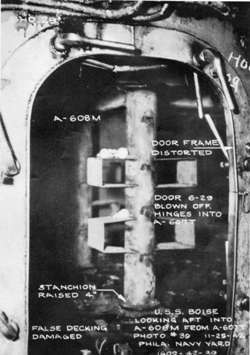 II handling room passed through fragment holes in bulkhead 39 and through the door, which was deflected aft, into magazine A-515-M. Here it ignited several exposed cartridge cases. The door in bulkhead 45. was dished aft a little and flame entering through scuttles, around this door and through a splinter hole in this door burned one man in turret III handling room but started no fires. 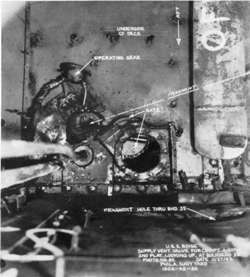 The fire spread to the lower handling room of turret I through the scuttles in bulkhead 29, set fire to powder there and burned up through the hoists in this turret, bursting them open as it did in turret II. 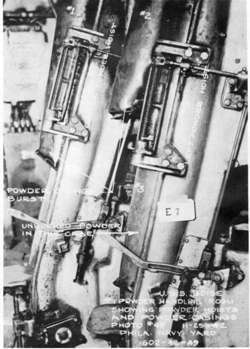 All exposed powder did not burn, however, as several cartridge cases were found in the hoists with unburned powder in them (photo No. 18). 16. It is noteworthy that while unburned cartridge cases were found in the hoists of both turret No. I and turret No. II, there was no regular pattern of burned and unburned cases. This agrees with the performance observed in 5.25 inch turret flash tests conducted by the British in 1938.
of the shell explosion in A-507-M. 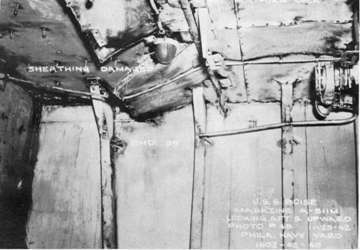 Doors to magazines A-511-M and A-512-M were deflected 3 and 4 inches respectively, allowing flame to enter these spaces and the exhaust duct from A-511-M was charred up to the second deck but no powder in these spaces was ignited. Doors in No. I handling room (including the door to A-507-M in bulkhead 29) were all dished outward 3 to 4 inches, but there was no evidence of fire in magazines A-503-M, 505-1/4 or 503-1/2. Hatch 5-28 in No. I handling room was blown down into A-601-T.
18. The gases generated in No. II handling room either burned or blew the rubber gasket out of the armored hatch in the first platform deck, but the dogs held and the hatch remained in place. This also happened in No. I handling room. Gases from No. II handling room passing through the opening under the hatch into trunk A-414-T, however, blew the third deck hatch off. The hatch bent in the middle, pulled out of the dogs and pulled the hinge pads from the deck. It flew up and flattened the firemain overhead against the second deck. These gases distorted surrounding bulkheads on the third deck, and sprung W.T. door 3-35-2 into the warrant officers' mess room. There was evidence of fire forward of this door. How it got there is not definitely established but it is probable that sufficient flame was forced through the edges of the door to start a fire within. The dogs remained operable and the door could be opened and closed, but it was not watertight. 19. The series of powder fires described in paragraphs 15-17 above was apparently over very quickly. Flooding of A-507-M through the shell hole apparently quenched the fires there before the powder in containers had a chance to ignite and the powder in the handling rooms and hoists burned up quickly. While the fires were very intense, they did not burn long enough to do much fire damage - paint, for example, was singed and blistered but did not show any evidence of having burned, and rubber telephone cords in the handling room were not burned. 20. An explosion is known to have occurred in the 20mm magazine A-608 under the forward part of A-507-M. The deck over this magazine was bulged up about 4 inches, stanchions in A-608-M were pulled clear of the inner bottom, and the door in bulkhead 29 was blown off its hinges into A-607-T. The blast also dished doors and bulkheads to surrounding magazines as indicated in plate I. 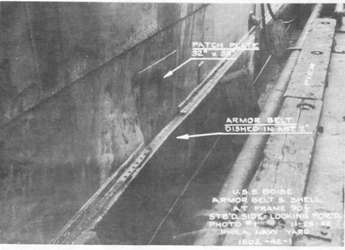 The exhaust duct from A-608-M was blistered up to the second deck as described in paragraph 23, but reference (b) reported no evidence of fire in the hold and it was ascertained from the ship's force that none of the ammunition in A-608-M ignited. Exactly how or when this explosion occurred has not yet been determined, but it is possible that oil may have leaked from the surrounding tanks and flames coming through the tears in the second platform deck where the stanchions in A-507-M were pulled up may have caused a vapor explosion. 21. The spread of flame from the magazine through the ventilation ducts contributed materially to casualties suffered as a result of hit No. 6. Mechanical exhaust ventilation for magazines or handling rooms is not provided. Air is supplied through vertical ducts by fans located an the second deck and is exhausted naturally by means of ducts which terminate on the second deck near the overhead. Both systems are fitted with gate valve closures in the spaces served and these closures are operated from adjacent handling rooms. In each magazine, between the exhaust closure and the compartment boundary, is a check valve for the purpose of relieving pressure in the compartment in case of flooding by the sprinkling system. There is also a check valve just above the second deck level on each of these ducts to provide an overflow at the designed test head. 22. As stated in paragraph 14 the gate valve on the supply system to A-507-M was opened by a fragment (photo No. 15), and the exhaust system also had its closure destroyed. Flames passed directly up to the second deck through both of these ducts. The supply line fed the gases into the main on the second deck and ruptured it over the fan between turrets I and II. Paint on all supply mains on the second deck for this system between frames 29 and 35 was badly blistered and was blistered in diminishing amount forward of frame 29. Paint on bulkheads surrounding these mains was also singed and blistered. The main and supply branches to the warrant officers' country on the third deck between frame 29 and 35 was also blistered, although surrounding structure was undamaged. 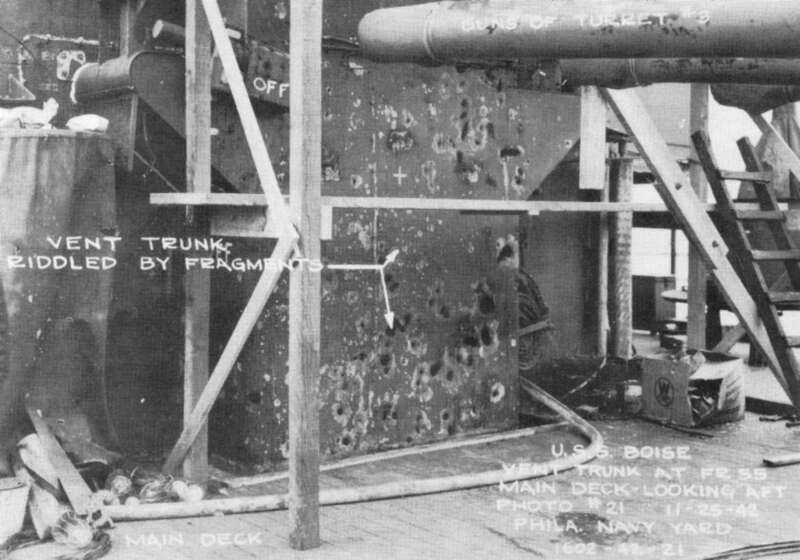 All members of the damage control party just aft of turret I on the second deck were killed by flames and gases from these trunks and several of the light stateroom partitions were destroyed and damaged. 23. Several casualties were also caused by flames in the ventilation system between turrets II and III on the second deck. The source of trouble here was the supply line to A-309-L. 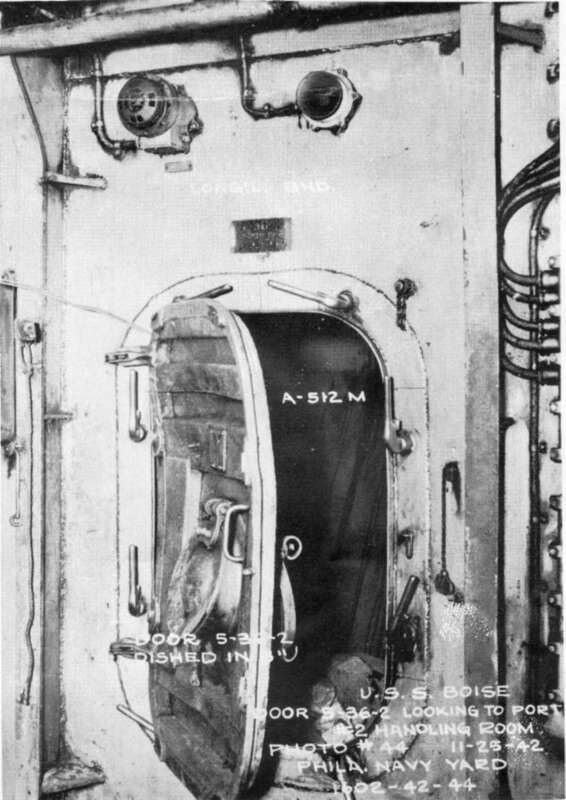 The gases coming up to the third deck through trunk A-414-T as described in paragraph 17 ruptured the vent duct at the valve supplying the Navigator's stores and gases passing up this duct to the second deck blew a valve open at the control station aft of turret II. Another source of fire in this area was from magazine A-511-M where the fire entered the exhaust duct through the check valve and passed up, blistering paint to the top of the duct on the second deck. 24. There was also evidence of heat on the surface of the exhaust duct from A-608-M all the way to the top on the second deck although the supply duct alongside was not damaged. There seems to be some doubt as to whether the valve in A-608-M for this duct was closed; but it is probable that the check valve would have allowed flames to enter anyway. The trunk was not ruptured although it passed through A-507-M at bulkhead 29. 25. One projectile (possibly two) struck the starboard side at frame 17 about the third deck level from a bearing of 106° relative. It exploded on contact and blew a hole in the 12 lb. shell plating between frames 16 and 18 and from 5 ft. above the third deck to 4 ft. below it. Splinters penetrated bulkhead 15 on the third deck and apparently bulkheads 15 and 19 below the third deck. The plating on the port side near bulkhead 15 was also penetrated. Degaussing cables were cut on both sides. Longitudinals overhead in A-305-L were badly cut by fragments, and piping and wiring were cut. All furniture and joiner bulkheads in A-305-L were destroyed. 26. This explosion was particularly noticeable through the ship and led many to believe they had been hit by a torpedo. 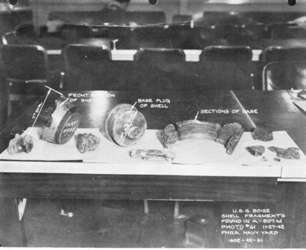 A pinch bar in the windlass room, A-205-E, was thrown from the starboard side and punched a hole in a ventilation trunk, probably as a result of the explosion directly below. Some difficulty was experienced in lining up the brake and clutch of the starboard windlass, but the winch remained in operation. There was no fire following this hit, probably due in part to the immediate flooding from the sea which is described in paragraph 32. 27. A projectile of unknown caliber glanced off the left side armor of turret II just below the rangefinder hood at some time during the action and made a gouge about 1-1/2" deep. No other damage was done by this hit, and there is no evidence to indicate that the shell exploded. It was estimated to have come from about 075° relative to the ship. 28. There was no flooding from hits 1, 2, 4, 5, and 8, minor flooding from hit 3, and considerable flooding from hits 6 and 7. The holes made by hit No. 3 were above the waterline, but waves and heeling on turns caused some water to be shipped through them. They were plugged with mattresses and shored, and the water was removed by submersible pump. 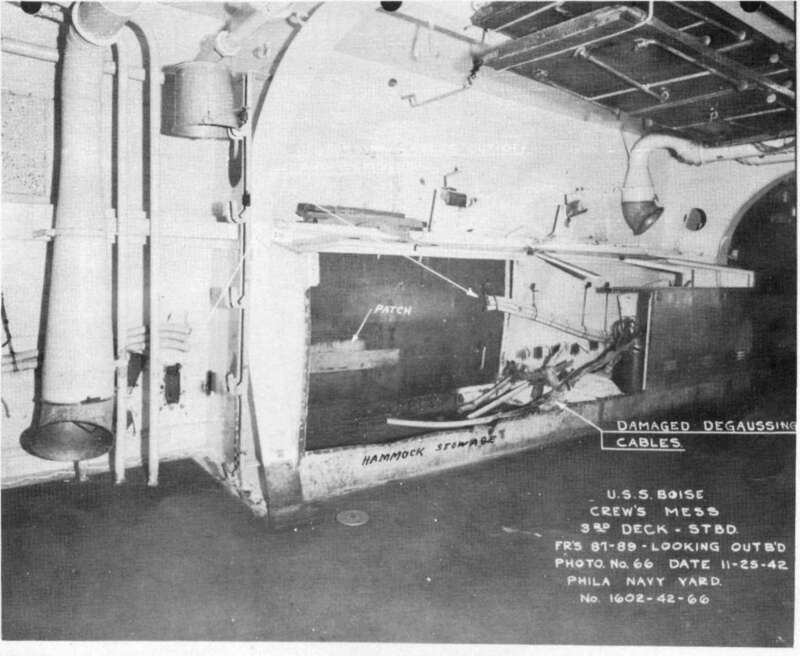 in the deck of A-507-M where the stanchions had pulled up and through the hatch in the deck of A-507-M, which was blown down. 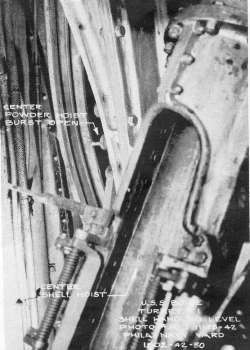 Wiring passages in the hold below turrets II and III were filled by seepage through bolted plates. 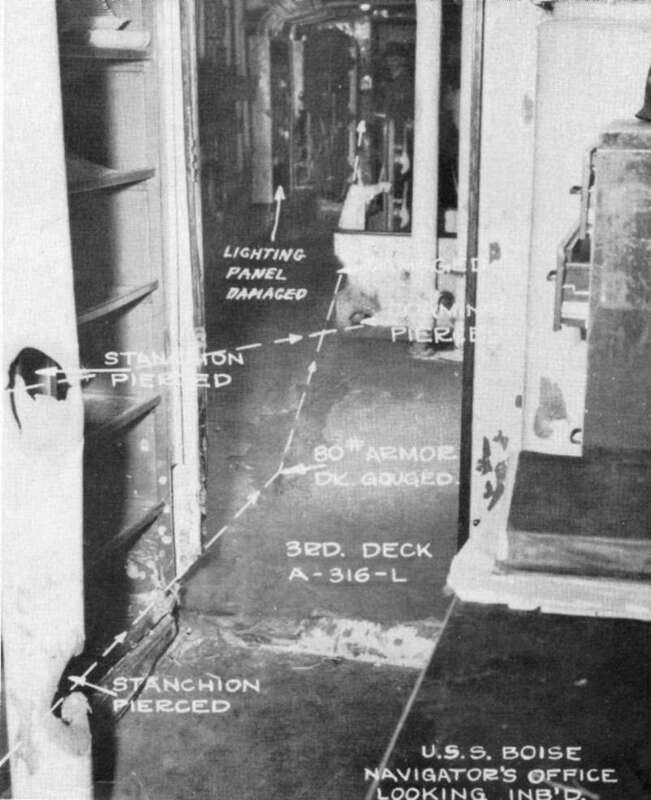 Further flooding took place as indicated on plate II, primarily through warped doors, scuttles, and the fragment holes in bulkheads 35 and 39, until all forward 6 inch magazines and handling rooms were flooded, and the hoist tubes were flooded up to the waterline which was just over the third deck. 5 inch handling rooms and magazines were flooded less extensively as indicated on plate II. 30. There was also some flooding on the third deck and first platform deck as a result of hit No. 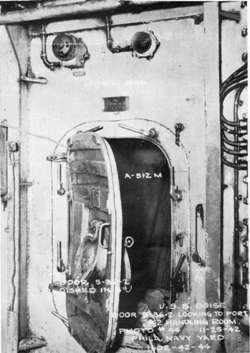 6, chiefly through the hatches to handling rooms I and II where the gaskets were burned or blown out. Trunk A-414-T flooded from handling room No. II and flooded up onto the third deck in passage A-309-L. The warrant officers' mess room A-308-2L was apparently flooded slightly through the door in bulkhead 35 which had been sprung by blast and had to be shored. Reference (b) reported that the sick bay on the starboard side aft of bulkhead 39 also flooded but it is not apparent how this could have happened. The first platform deck immediately over No. I handling room was flooded through the armored hatch in the same manner as A-414-T.
31. A-414-1/2 and 419-1/2-L were reported flooded by reference (b). 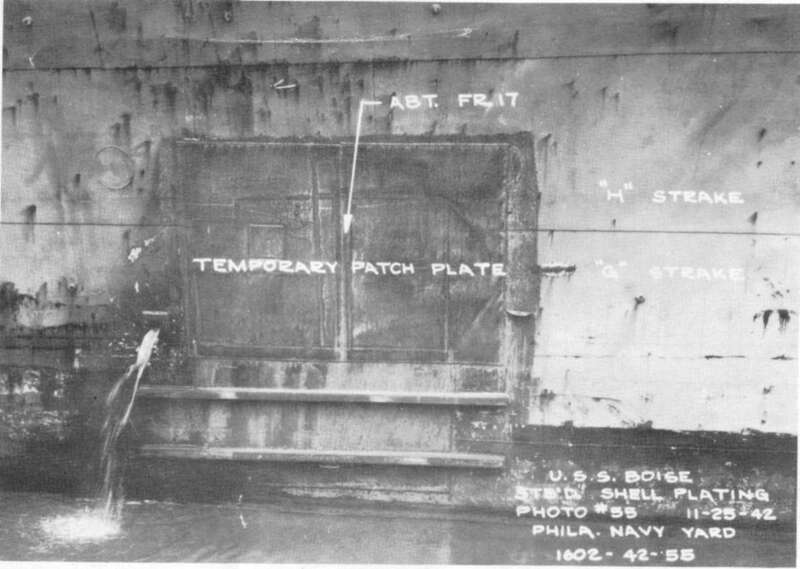 The reason for this flooding is not apparent, but it is possible that the hatch to the handling room below was not tight, a situation which is known to have existed in A-411-L where an armored hatch to the wiring passage on the starboard side at frame 32 could only be made tight by shoring to the deck above. The crews' space was flooded to an unreported depth through the hatch at frame 32 and the trunk room aft of bulkhead 35 on the starboard side was flooded to a depth of 3 ft. from A-411-L through unpacked stuffing tubes on degaussing cables. 32. Hit No. 7 opened A-405-A and the living spaces on the third deck between frames 15 and 23 to the sea and fragment attack destroyed the watertight integrity of bulkheads 15 and 19, allowing A-406-A, and 404-E to flood also. 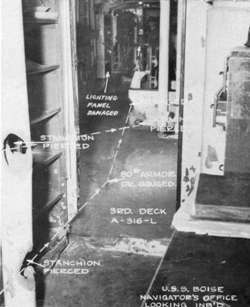 The third deck flooded about 3 ft. deep and A-304-A flooded slowly through fragment holes in bulkhead 15. Pump room A-601-E flooded a few feet when the hatches were opened to get a man on duty there out, but it was tight when the hatches were closed up again. Bulkhead 23 was observed to be working and it was shored, apparently on the third deck in A-306-L. Reference (b) reported A-407-A flooded by slow flooding but it is not apparent how this flooding occurred. There are no doors to this space in either bulkhead 23 or 25.
topside. It involved considerable difficulty due to the necessity for maintaining watertight integrity and the simultaneous job of running discharges through hatches. 34. Numerous cables were cut and switches damaged by fragments from the various hits, as is to be expected. The degaussing cable was cut by hits 1 and 7. The power supply to gun #1 was cut by hit No. 2 in the Captain's cabin, and ventilation to the wardroom and plotting room was stopped by hit No. 3. Several lighting circuits failed, for example the one supplying the main deck and above between frames 55 and 65, and the lighting system for the third deck and below forward of frame 6l. This latter system was put out by damage to the lighting panel by hit No. 3 (photo No. 6) which caused the circuit breaker to open. This had no serious consequence however, as systems for the handling rooms and turrets were separated. Almost all of the numerous small circuits near hits 2 and 7 were destroyed. 35. Flooding caused most of the damage to the equipment in the areas subjected to fire and flooding - the fire, as has been stated previously, did not burn long enough to do much damage to structure and equipment. In several of the compartments, such as A-515-M, A-517-M, A-523-M and A-508-T, the equipment was found to be in satisfactory operating condition after being dried. Considerable flooding of watertight equipment was caused by fragment damage to the equipment itself or by seepage through damaged cables. 36. No damage was suffered by main or emergency switch boards and no breakers were tripped by shock although they were not locked in. When turrets I, II and III were put out of action all supply breakers for them were pulled by the ship's force to prevent possible electrical fires due to short circuits and overloads. 37. 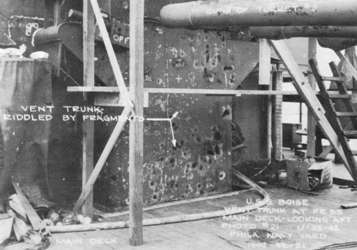 The casualty power system, which consists of portable leads and fixed bulkhead fittings for passing the power through bulkheads, functioned very well, but the installation was not extensive enough. Flooding was such that it was impossible to use bulkhead terminals on the third deck forward of frame 45. This made it necessary to run power forward on the second deck with portable cables; a difficult and slow job as there were no bulkhead terminals on the second deck forward of frame 45.
information obtained by these ships in relation to BOISE's position indicates that she was hit from about 7500 yards. At this range our 8 inch projectiles have an angle of fall of about 3-1/2". They will ordinarily ricochet up to about 12° angle of fall and about 20° (corresponding to 18,000 yards range) is necessary before they will reach 9 ft. depth with any appreciable velocity. The ship was reported to be on a steady course and the sea was calm, therefore, rolling or rough water does not offer an adequate explanation. If hits No. 5 and No. 6 were in the same salvo (as suggested in paragraph 13) the hole in the barbette is an indication that these two shots were fired from relatively short range. 39. Several large fragments of this shell and a large portion of the one which hit barbette No. I were recovered (photos 12, 15 and 16). Analysis of these fragments is interesting. Preliminary inspection indicates that they are of English manufacture and that the one which exploded in the magazine had a flat nose with a windshield screwed on over it. This might explain the unusual underwater trajectory if the windshield were knocked off on contact with the water. Furthermore, if the other shell had a flat nose, it would help to explain its failure to penetrate at such short ranges. Experiments have been conducted to determine the effect of flat nosed projectiles on armor and it was found that they were unusually effective against light armor but poor against anything over 1/2 caliber thickness. It is hoped that more detailed information concerning the shells made for the Japanese can be obtained. Accurate identification and further analysis might then be possible. 40. The performance of 6 inch class "A" barbette armor in defeating an 8 inch A.P. Projectile fired at close range is of considerable interest. It is probable that the breaking up of the shell was principally due to the fact that the armor was face-hardened. Penetration resistance against high quality projectiles is about the same for class "A" and class "B" armor, but if this had been class "B" armor it would probably not have broken the projectile and an explosion would have resulted. These figures can be only approximate, but they will give an idea of the general distribution of the powder burned. 42. Another interesting point is the performance of the magazine bulkheads. These bulkheads were designed to reach the elastic limit with a pressure of about 13 lbs./in2 (test head pressure to the second deck gives about 10 lbs./in2). Bulkhead 35 was buckled about 2 inches in a few places, probably by the explosion of the projectile, but no other bulkheads were noticeably distorted. Tests with burning powder indicate that a bulkhead designed for 10 lbs. pressure will withstand peak pressures, which are of very short duration, up to 60 or 70 lbs./in2 without destruction, but it is probable that the sustained pressure in the magazines of BOISE did not exceed 10 lbs./in2 very much or there would have been some distortion. The hoist tubes were burst open, and it is estimated that about 70 lbs./in2 was necessary to do this. In them the powder is quite closely confined and relieving into the surrounding spaces inside the turrets was apparently sufficient to drop the pressure and prevent other structural damage. Smokeless powder has a critical pressure in the vicinity of 1000 lbs./in2, above which it burns so rapidly as to give the effect of an explosion. Obviously, the pressures developed in BOISE's magazines were never high enough to give more than a slow burning effect. 43. The British from a series of tests, reported in N.A. London Serials 558-1940 and 678-1940, developed a rough formula for venting of powder fires which eliminated density of loading and compartment volume and for this reason was open to some question. It was based on tests using cordite and this undoubtedly leads to some discrepancies with what we could expect due to the fact that cordite is less stable and burns faster than our smokeless powder. It is interesting to apply the formula in the case of A-507-M, however, for comparative purposes. 44. By this formula the area necessary to vent a cordite fire (sq.ft.) equals 1/8w2/3 where W is the weight of exposed charge in pounds. Applying this with the estimate of 400 lbs. given in paragraph 40 we get a required vent area of 6.8 ft.2. up the pressure. Considering all aspects, therefore, it seems probable that venting, while it undoubtedly contributed to the survival of BOISE, was not as important as the quick flooding of the source of the fire in A-507-M, the reluctance of powder in cartridges inside tanks to ignite by heat from the outside, and the small amount of powder exposed. 46. The Damage Control Officer, as a result of his experience pumping out after the holes had been plugged and the situation gotten in hand, recommended that a valve fitting be installed on overboard drains where they go through the hull. This fitting should take the discharge from submersible pumps, and would thereby obviate the necessity for running discharges topside through hatches and over the side, conflicting with the requirement for continual setting of condition Zed. They would not involve additional holes in the shell, they would require a lower pumping head, and would be of great assistance in time of emergency. The Bureau is considering adoption of this suggestion. 47. The action of the ship's force in pulling all power circuits to the forward turrets when these turrets were out of action was an excellent move and it undoubtedly prevented further trouble and possibly fires from circuits shorting out in this region. 48. Ship's personnel were well pleased with the performance of sound powered phones. No failures were experienced except where lines were actually severed. 49. It has always been considered necessary to prevent flame from reaching the magazines from above on the basis that once flame reached the magazines it would be fatal. The case of BOISE shows that this is not necessarily so and forcefully points out the necessity for providing protection against the spread of fires from below. 50. It is to be noted that there are no sprinkling arrangements in powder handling rooms, hoists, or turrets. This is a result of the general policy which requires sprinkling for all exposed powder bags and all ammunition stowages but does not require sprinkling of case ammunition except in stowages. It seems probable that in this case had an effective means of sprinkling the hoists in turret I been available when the turret was ordered abandoned, the fire would not have burned up through the turret from the handling room. Another possible, though more difficult, means of preventing this would be the provision of flame seals at the ends of the hoists to prevent direct passage of the flame up to the gun room. felt that the contribution of these scuttles to venting the magazines was of less value in this case than prevention of the spread of the fire up the powder train would have been. 52. The measures pointed out in paragraphs 49 through 51 are now under discussion with the Bureau of Ordnance. They are complicated by numerous questions of rate of fire, arrangement, and detail design, but it is hoped that decisions can be reached at an early date to improve present and future designs. Photo 1: Showing dent in armor and patch over hole shell. Photo 2: View inside showing location of degaussing cable cut by fragments. Photo 3: Looking outboard in Captain's cabin. Photo 4: Centerline bulkhead showing fragment damage in forward part. 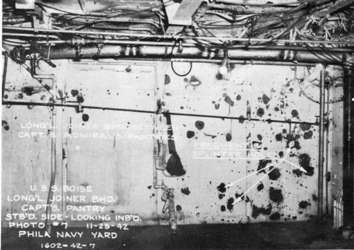 Photo 5: Viewed from starboard side in Navigator's office and showing approximate paths of projectiles. Photo 6: Lighting panel damaged by splinters, and holes in bulkhead of overcoat locker. Photo 7: Showing hit on face plate of turret III and damage done to main deck. Photo 8: Fragment damage to vent trunk on superstructure at frame 54. Photo 9: Fragment damage to second deck below hit. Photo 10: Location and damage to main deck. Photo 11: Closeup showing performance of armor. Photo 12: Projectile as recovered from the barbette. Photo 13: Portions of base of projectile. Markings and design features indicate English manufacture. Photo 14: Fragment damage to bulkhead 35 viewed from magazine A-507-M.
Photo 15: Fragment damage which opened closure to supply ventilation system and conducted flames to second deck. Photo 16: Fragments of projectile which exploded in A-507-M.
Photo 17: Shows powder hoist burst open on shell handling level in turret I. Photo 18: Lower handling room of turret I showing open ends of powder hoists with powder cartridges still in hoists. Note that powder burned out of No. 1 and No. 2 cartridges but not No. 3. No. 2 cartridge was apparently forced down over No. 3 by pressure from powder burning above it in the hoist. Photo 19: Typical damage to magazine doors in handling room No. II. 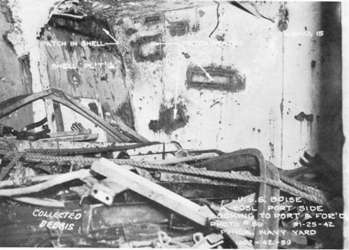 Photo 20: Damage inside Magazine A-511-M. There was no fire here, except what came in through the distorted door - see photo 19. Photo 21: Patch plate on hull. Photo 22: Fragment damage on port side of third deck -opposite hit. The debris in the foreground was collected and stored here as scrap. Photo 23: Door to Magazine A-608-M - the scene of a separate explosion as described in paragraph 20.